Line cookie sheet with waxed paper. 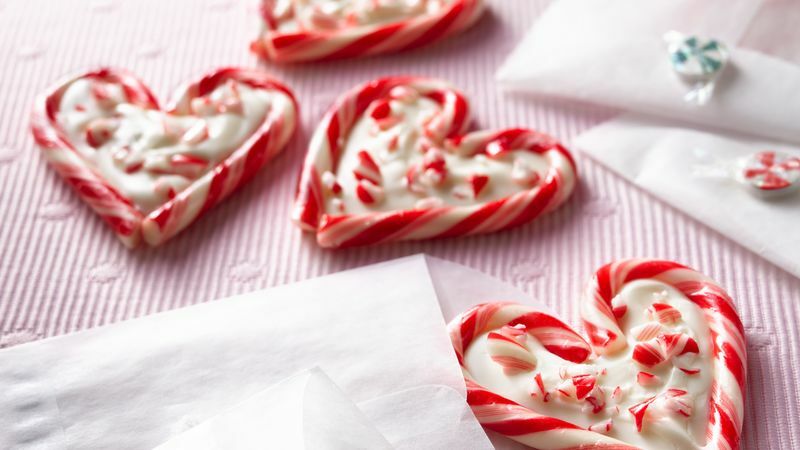 Arrange candy canes on waxed paper in groups of 2 with ends touching to form heart shapes. In 2-cup microwavable measuring cup, microwave candy coating uncovered on Medium (50%) 2 to 3 minutes, stirring once halfway through cooking time, until softened. Stir until melted and smooth. Spoon or pipe candy coating into centers of hearts to fill spaces. Sprinkle with crushed candy. Cool 30 minutes or until set. Chocolate-flavored candy coating can be used instead of the vanilla coating. Or make two batches—one of each! Candy coating, also called confectionary coating, is used for preparing and dipping candy. Whether left white or tinted pastel, candy coating melts and sets easier than chocolate. Look for candy coating in the baking aisle of the store.